This academic year is off to a busy and productive start for our faculty and students. First, congratulations to Corey Mulvihill and Rosalind Abdool on successfully defending their dissertations! Corey Mulvihill defended his thesis, “Existence Assumptions and Logical Principles: Choice Operators in Intuitionistic Logic.” His supervisor, David DeVidi, remarks that “Corey’s thesis was one where there are not that many people around with the range of expertise needed to be competent examiners for it. It’ll sound like some bizarre code to most people, but in a sentence or two what he does in the thesis is investigate what happens when you add David Hilbert’s logical choice operators to L.E.J. Brouwer’s intuitionistic logic, and concludes that what happens teaches us important lessons about realism and antirealism that are best seen through the lens of Michael Dummett’s writings on the subject. Dummett’s program can be seen to be much improved with the addition of these new insights, but the insights, in the end, can be seen to be independent of Dummett’s approach. Anyway, for a thesis like that the external had to know a lot of 20th-century philosophy of mathematics, be on top of the non-classical mathematical logic, and know the current scene in metaphysics. Luckily, we were able to bring in Greg Lavers from Concordia as an examiner, and Corey did a terrific job defending what I think was a very ambitious thesis. It’s also impressive, I think, that he was able to finish his writing even while being the primary caregiver as a new parent these past couple of years and while living in Switzerland where his partner had landed a job. Skype is a wonderful thing for supervisors and grad students.” Corey and his family are now back in Canada, and he has started a job teaching at the University of Ottawa. Patricia’s book, Moral Reasoning in a Pluralistic World, is now out! For a limited time, the Kindle version is only 16.47 CAD. [http://www.amazon.ca/Moral-Reasoning-Pluralistic-Patricia-Marino-ebook/dp/B0159D27YO]. It is also available at Indigo [https://www.chapters.indigo.ca/en-ca/books/moral-reasoning-in-a-pluralistic/9780773546158-item.html] and at the publisher’s home page [http://www.mqup.ca/moral-reasoning-in-a-pluralistic-world-products-9780773546158.php]. 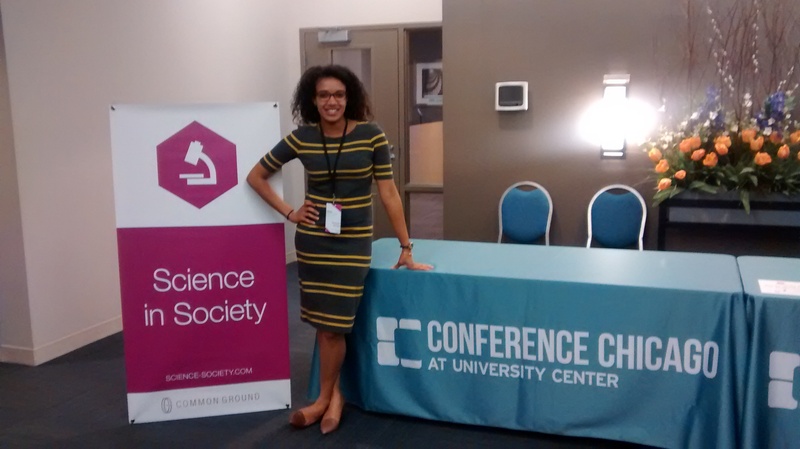 Teresa Branch-Smith presented at the Science in Society conference in Chicago on a collaborative project she worked on with Jay Michaud on the training of science communicators. 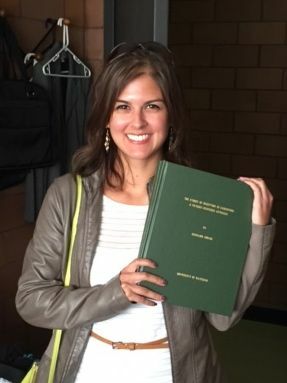 She also won their Graduate Scholar Award to attend [see http://science-society.com/the-conference/graduate-scholar-awards#2-tab]. Congratulations, Teresa! Several departmental faculty members have been involved in public events drawing attention to an important election issue: the alarming state of research policy in Canada and growing disregard for evidence when policy is made by the federal government. 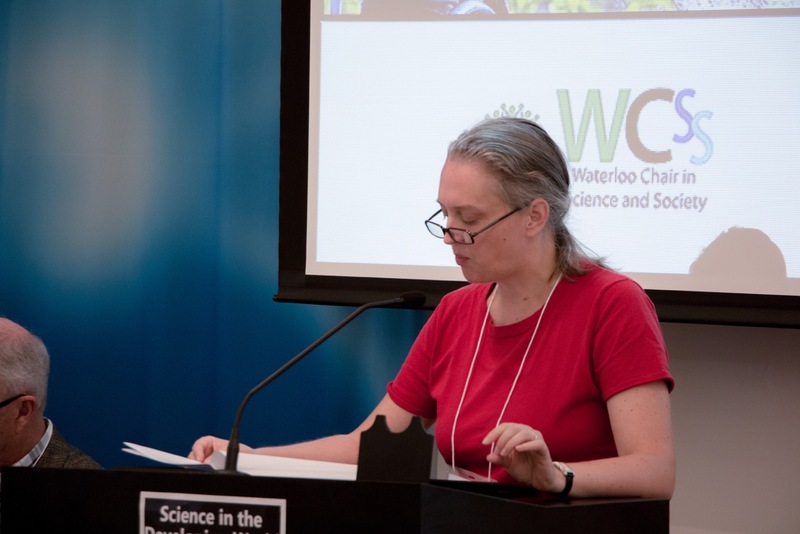 On Friday, Sept. 25, Paul Thagard and David DeVidi were two of four Waterloo faculty members who took part in Talk Science, an event largely organized by one of our undergraduate students, Justin Singer, on behalf of Evidence for Democracy, a non-partisan group “promoting the transparent use of evidence in government decision-making in Canada.” Justin and his team did a great job organizing, managing to completely fill a fairly large room. Paul’s remarks were a high-level discussion about why science policy matters, and why basing government decisions on the best available scientific evidence, rather than myths or mere ideology or religious conviction or whatever else, would be beneficial to everyone, and drew some lessons about what voters should look for from political parties when considering how to vote. Dave focused his remarks on why people in Canada’s research communities have come out of their labs and offices to speak up on this issue now, noting the gag orders on federal researchers preventing them from sharing their research with the citizens who have paid for it, the gutting of environmental and safety regulations and the reduction in the capacity of the government to enforce those that remain, and so on. After the remarks from the academics, there was a question and answer session with the NDP, Liberal and Green candidates for the Waterloo riding. The Conservative candidate declined to attend. On October 1, Dave and Heather took part in the latest in the Canadian Association of University Teachers town halls in their Get Science Right series, this one titled Science and Democracy Under Threat: What You Can Do About It. 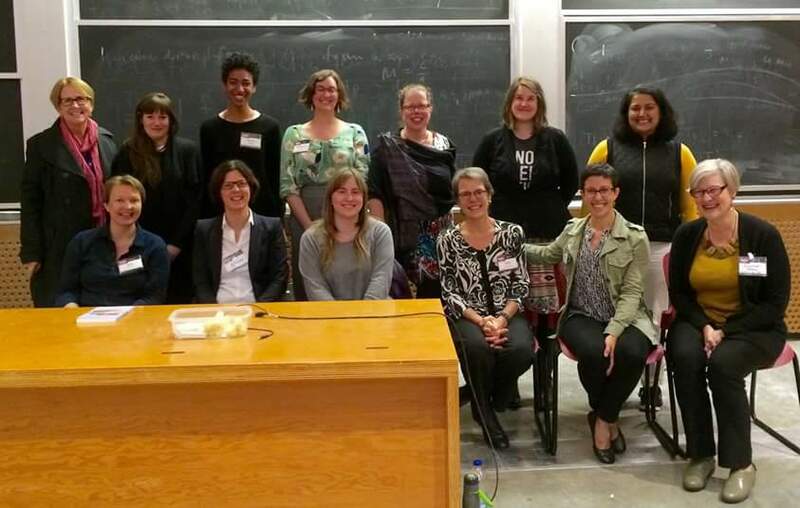 The event was co-sponsored by CAUT, the Faculty Associations at Waterloo, Laurier and St. Jerome’s University, and Evidence for Democracy. As a panelist at the very first Get Science Right town hall in 2013, Dave was invited to give a short welcoming address in which he reviewed the range of alarming developments that had led to an unprecedented mobilization of Canada’s research and scientific communities to press for changes. He highlighted the federal government’s muzzling of researchers and the silencing of critics, “political vandalism” like the cancellation of the long form census and other actions that prevent us, as a society, from gathering the information that would allow us to govern ourselves sensibly, the restrictions on public access to information and research gathered by government researchers, a disproportionate focus on redirecting Canada’s scientific activity away from basic research and public interest science towards the development of commercializable products, and so on. Heather’s remarks focused on making clear why these changes are a big deal. She made a case that these trends are highly corrosive for our democracy, undermining our ability to assess the decisions made and policies enacted by our governments, supposedly on our behalf. She finished by describing four key principles endorsed by the Science Integrity Project that describe an appropriate role for science in the policy-making processes of democracies, and warning that merely changing the government in this election will not suffice to turn things around in Canada—that will take a mobilized citizenry who will hold whatever party is in government to account. The other speakers at the event gave a first-hand account of the efforts it took to mobilize first scientists and then the Canadian public in an effort to save Experimental Lakes Area from the short-sighted decision to close it, and what steps Canadians can take now to make this an important election issue and to sustain the effort to make lasting change. The presentations were followed by a lively question and answer period. 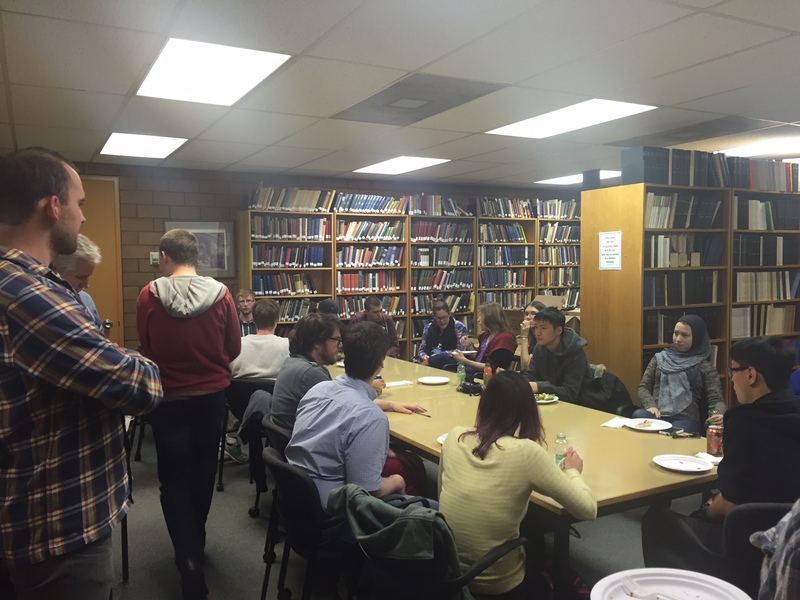 The Undergraduate Philosophy Society held its first pizza social of the semester on October 1. It was very well attended, with 41 people showing up. Everyone had a good time and enjoyed engaging each other in conversation. The next PhilSoc event is planned for later in October, where Doreen Fraser will be giving a talk on Einstein.